The U.S. Mexico border is now the most militarized border in the world between two countries at peace. Since 9/11, the U.S. has poured money into securing its southwest border, nearly doubling the number of border patrol agents, and putting up over 650 miles of new fencing along the border. This defensive strategy seems like a logical move for the United States, however it alone has not proven to halt the willfulness and persistence of immigrants who wish to or need to cross. Because the Department of Homeland Security has created a situation where it is more difficult than ever to enter the United States illegally, but there are still inescapable push-pull forces causing populations to migrate, the job of “polleros,” smugglers who drive hidden migrants across the border through road ports, has become more and more in demand, and more and more lucrative. 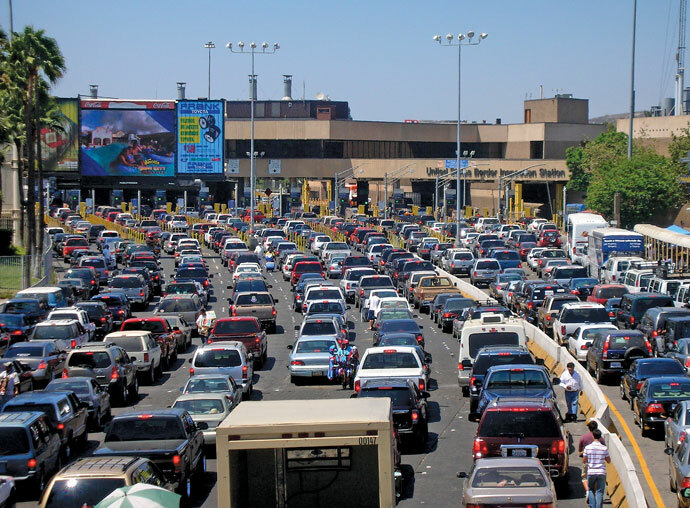 While many Americans have the perception that immigrants cross the border into the U.S. by trekking through the desert, about ⅕ of undocumented immigrants actually resort to crossing through the U.S./Mexico ports, usually in the car of a paid pollero. The drivers use special precautions in order for the car to make it through security inspections and ensure business runs smoothly. The migrants are usually hidden in small compartments within the vehicle, fake documentation is used, and/or border inspectors are paid off. If caught, the pollero goes straight to the back of the line to try again immediately with the same clients. With all these measures taken, the success rate of this form of border crossing is surprisingly high, and so are the costs. An unforeseen consequence of the post-9/11 changes to border security is that with the higher risk of crossing, the price of contracting a pollero has gone up allowing them to devise more sophisticated organizations. Smuggling has become very efficient, very dependable, and extremely profitable for the pollero. Many have begun to work in complex networks with one another, entangling with corrupt government, and drug cartels for protection. More profit and cooperation has also made these networks more inclined to engage in higher crimes such as human and drug trafficking. Because of this, pollero networks have come to be yet another crime and human rights issue local governments in Mexico and U.S. border patrol have had to worry about.